Can you believe it’s prom season already? This year for Kamri’s prom we wanted to mix it up! Que, the #CGHInfinityBraidCombo! It’s cute and a little daring and is the perfect compliment to any dress! Items Needed: Brush, spray bottle, 5-6 small (clear or black) elastics, spray wax, hair clips or barrettes. 1. Pull the hair back into a low, fluffy ponytail. Secure with elastic, and wrap hair around to hide the elastic. 2. Divide the ponytail into 2 sections and begin pulling small pieces from the outside of each side of the ponytail, crossing over to the other section. 3. 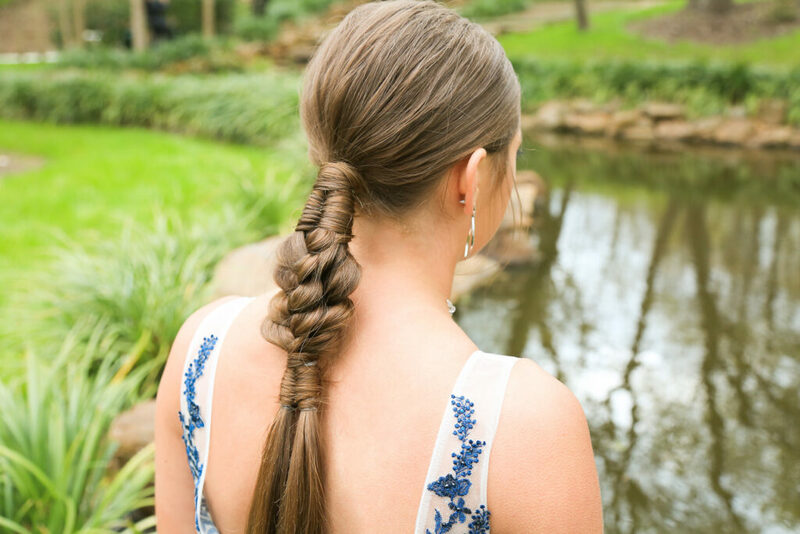 Go down a couple of inches with that section of infinity braid (or however far you’d like – depending on the length of hair). Secure with elastic and wrap hair around the elastic. 5. Secure each individual 3 strand braid with an elastic, then secure both of the braids together with 1 elastic, wrap hair around the elastic. Pancake the braids to give them a fluffier look. 7. Style with any hair clips or accessories to personalize and give it a little extra oomph!